Have you calmed down yet? Has it all sunk in yet? My answers to both are no. But what matters is how the Bulls players answer those questions. Last week’s memorable seven overtime loss to Western Michigan was an amazing, historic game. Despite the comeback, the records and the individual performances…it was still a loss. Bull Session Trivia: The Huskies have a player who’s the son of a notable former Buffalo Bill. That NIU player plays the same position as his father, and wears the same number. The Huskies Dad is famous for his Super Bowl appearances, and how he didn’t Lett the Cowboys score an easy touchdown. Can you name the NIU player and his famous father? A month ago, Drew Anderson was a backup who had thrown one pass. Now, he’s got the highest single game passing performance in the NCAA this season (597 yards). He holds the MAC record for passing yards, and tied the mark for touchdowns (7). 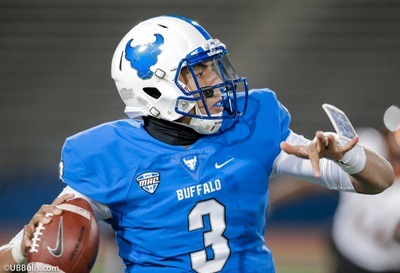 Anderson owns the UB school records for passing yards and touchdowns. It’s an amazing journey, and a tribute to Drew’s perseverance. Add in a touchdown run, a two-point conversion catch, no sacks and four completions of more than 50 yards and you have one of the most complete passing performances ever seen. Drew was always calm, always in control and never rattled. He’ll start again against NIU, and I can’t wait to see the encore performance…Anderson is being helped by a maturing wide receiver group. K.J. Osborn and Kamathi Holsey had breakout games. Holsey (6 catches, 143 yards, TD) used his speed and size to make plays. Osborn (7 catches, 138 yards, 3 TD) showed he is a reliable target with toughness and playmaking ability. K.J. did most of his damage playing the slot, filling in for injured seniors Jacob Martinez & Jamarl Eiland. 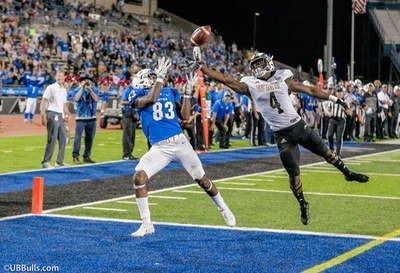 Osborn hadn’t practiced at that spot since the preseason…Anthony Johnson once again showed he’s become one of the top receivers in the country. He had 11 catches for the second time this season. His 631 yards receiving are 5th in the NCAA. This week he was added to the Biletnikoff Award watch list, an award given to the top pass catcher in the nation. Johnson has four catches of more than 46 yards this season…The Bulls offensive line has not allowed a sack in two games, a total of 85 pass attempts…Anderson has gone 76 straight passes without an interception…In the last few overtimes, the Bulls were down to 4th string running back Kameron Pickett. That’s because Johnathan Hawkins and Emmanuel Reed were hurt, and he came in after Theo Anderson fumbled…UB is now up to 2nd in the MAC in total offense…But this week, they’re going against the #1 ranked MAC defense. The Huskies are the top team in total yards, scoring defense, passing yards, rushing yards, third downs and red zone defense. Their 15 sacks are tied for second…Defensive end Sutton Smith leads the nation in sacks and tackles for loss. Last week against Kent State, Smith had three sacks and four TFL’s. Smith played with Bulls LB Jarrett Franklin in high school in Missouri…Outside linebackers Bobby Jones IV & Juwaun Johnson are active and fast. They are the Huskies top two tacklers…Cornerback Shawun Lurry is the NCAA active leader in interceptions with 14. His 87-yard interception return was the big play in NIU’s upset of Nebraska…The Huskies held Kent State to just eight yards of offense in the second half. On the surface, giving up 71 points might not reflect well on the UB defense. But there were encouraging signs from that unit, as they battled against one of the top offenses in the conference. The Bulls forced two interceptions and allowed only three pass plays of 20 yards. They won’t be the first defense to be worn down by Western Michigan’s running game…Khalil Hodge continues to get better every week. He had his first career interception, and his third game of 17+ tackles. He is #2 in the NCAA in tackles…Ishmael Hargrove came off the bench, and played like he did last year with 10 tackles…With Chris Ford out, Chibueze Onwuka made his first start at defensive tackle…DT Justin Brandon had another big game, with seven tackles…CB Cam Lewis returned after missing two games, wearing a club on his broken hand. He still had eight tackles…Ryan Williamson’s 15 tackles give him 200 for his career…The Bulls have five interceptions this season, but no fumble recoveries…Northern Illinois may start its third different quarterback of the season. Marcus Childers, a redshirt freshman, came off the bench last week and threw three touchdown passes. He also ran for 65 yards. He replaced Daniel Santacaterina, who’s thrown four interceptions in the last two games…RB Jordan Huff is the MAC’s third-leading rusher. He topped 100 yards against Nebraska & San Diego State…Tight end Shane Wimann is a threat in the red zone. He has 13 career TD’s, and holds the school record for TE’s…NIU’s offensive lineman is left tackle Max Scharping, a three-year starter who was All-MAC last year. Throughout the season, injuries have tested the Bulls depth. In nearly every case, young players have taken advantage of that opportunity. It starts with Anderson, filling in for Tyree Jackson. At running back, Reed has grabbed the top spot with Theo Anderson and Pickett getting their chance. The Bulls didn’t skip a beat when receivers Martinez & Eiland went down. On defense, Lewis missed two games. That gave a player like Roy Baker a chance to shine. With the defensive line missing Ford, and wearing down as the game went on, players like Christian Gonzalez and Jake Fuzak got a chance to play. No team will avoid injuries, and every team will need to use their backups. So far, those young Bulls are passing the test. Bull Session Trivia Answer: Huskies wide receiver Chad Beebe is the son of former Bills wide receiver Don Beebe. Don was a part of all four Bills Super Bowls, and then won a title with Green Bay. He’s famous for chasing down Dallas’ Leon Lett, preventing a touchdown in Super Bowl XXVII. Chad was born in Buffalo, and honors his father by wearing #82.